The registration figures are released on a monthly basis from the MCIA. The report looks at new registrations for all road legal vehicles of all types and capacities. In the past number of years there has been one very familiar placement. Honda and Yamaha have dominated month after month for years. Given that their ranges include not only 125cc models but also larger capacities it's clear to see that both of these companies offer comprehensive ranges catering to a broad selection of the motorcycle industry. That makes it all the more surprising that Lexmoto, a brand only created in 2007 and only featuring a selection of 50 and 125cc models has disrupted the monopoly at the top. 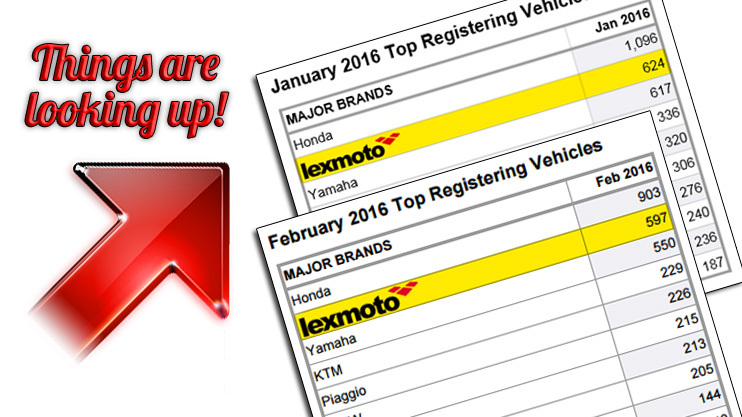 With 624 units registered, Lexmoto beat Yamaha who recorded 617 registrations during January. Continuing momentum Lexmoto repeated the feat in February with 597 registrations topping Yamahas 550. Although Lexmoto finds itself a considerable number behind Honda it is certainly a sign that the confidence in Chinese motorcycles and scooters is growing. Lexmoto would like to thank all new riders and dealerships who assisted in achieving such a fantastic feat. We wait to see how the rest of the year progresses.